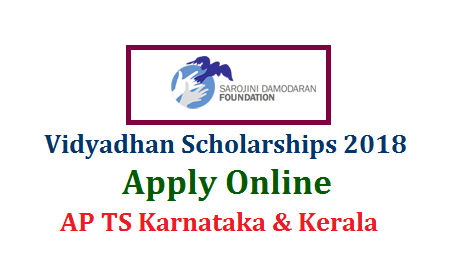 Vidyadhan Scholarship Program from Sarojini Damodaran Foundation supports the college education of meritorious students from economically challenged families. The students are selected after completion of 10th grade /SSLC through a rigorous selection process including test and interview. Currently Vidyadhan program has around 2800 students across the following states: Kerala, Karnataka, Tamil Nadu, Pondicherry, Andhra Pradesh, Gujarat, Maharashtra and Telangana. Those selected will be eligible for two year scholarship from the Foundation. If they continue to do well, they will be given scholarship for pursuing any degree course of their interest; these scholarships are directly through the foundation or external sponsors who have registered with the Foundation. The scholarship amount for graduation courses varies from Rs 10,000 to Rs 60,000 per year depending on the state, course, duration etc. The selected students will be required to attend the mentoring programs from the Foundation. You need to have a personal Email Account to apply online. DO NOT USE THE EMAIL ID of cyber café/DTP centre since all future communications will be sent to the registered email id. If you do not have an email ID, please create a new account in www.gmail.com or with any other email service providers. Please memorize the email login and password for future use. First Name: Please mention your first name as per your educational records. Last Name: Please mention your last name as per your educational records. Email ID: Please mention your email address and do not forget to regularly check this email account for our intimation. For future login, use the email id. Vidyadhan Password: Please choose a complex password for the user name you have created above. The Password should have at least 8 characters. This password is not same as the password you have created for the email id. When you log into the vidyadhan application next time, you have to use the email id and the vidyadhan password you have created. Please remember it; do not write it anywhere for security reasons. If you forget the password then you can retrieve it by clicking "Forgot Password" link in the Home Page. Click on "Apply Now " button. An email will be sent to your email account with account activation link. Please open your email in a new window and open the account activation email. Click on the activation link provided in that email. This will open the home page with a message that Account is activated and a login form to proceed further. Please login with the email id and the vidyadhan password that you have entered in Step 2 above while registering a new account. After you login you can see a link "Help" on the main menu. You can click on that link to read help and instructions for creating an application, updating and tracking it. Please select the appropriate scholarship program from the list available programs and click on the 'Apply Now' button to create your application. After creating the application you can edit it and make changes by clicking on Edit Application on top of the application. After you complete the application and submit, you will get a message “submission successful”. However please note that the application will be considered complete only after you upload the mandatory documents and photograph. Please check your email regularly for communication and updates from SDF. Students whose family annual income is less than Rs. 2 Lakhs and who have completed their 10th grade/SSC exam in the year 2018 from Andhra Pradesh. They should also have scored 90% or obtained 9 CGPA in their 10th Grade/SSC examination. The cut off mark for students with disability is 75%. SDF will shortlist the applicants based on the academic performance and the information provided in the application form. The shortlisted candidates will be invited for a test/interview. Exact locations for the test and interview will be informed to the shortlisted students individually. SDF will reimburse the out of district travel expense of the student and a parent for eligible cases. 10th July to 30th August 2018: Interview/Tests will be scheduled during this time frame. Exact date and location will be intimated to each of the shortlisted candidates. AP : For any clarifications send an email to vidyadhan.andhra@sdfoundationindia.com or call Umasankar, Phone: 8367751309. For any clarifications send an email to vidyadhan.telangana@sdfoundationindia.com or call Umasankar, Phone: 9652400518.